After taking last year off, I’m happy to say that I’m heading back to San Diego for another Comic-Con International! As a result, The Nerds of Color will be attending and sponsoring a couple events throughout the weekend. I’m also on multiple panels for the first time! So check below for all the places you can catch me at Comic-Con this weekend! While Comic-Con kicks off on Wednesday, July 18, I don’t get to town until Friday. 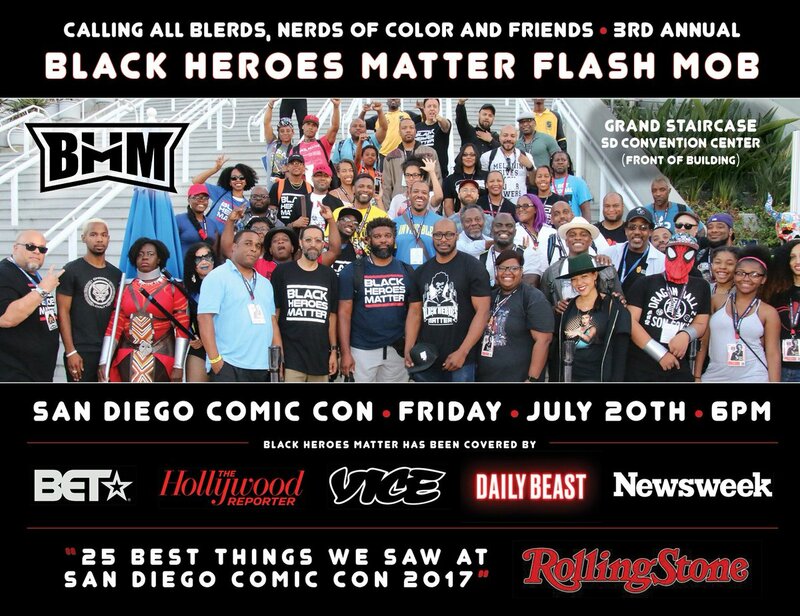 But the first thing I’m going to take part in is the third annual Black Heroes Matter Flash Mob. I was fortunate enough to be there for the inception of the BHM movement in 2016 and happy to be back to support URAEUS and David Walker once again. Immediately after everyone assembles in front of the Convention Center, I’m heading to the Hilton Bayfront to co-host our annual Comic-Con meetup at the Pool Club. Formerly known as BGNOC, we’re partnering up with the Women in Comics Collective this year to host a mixer for nerds of color, women in comics, and more at SDCC! Moreover, we’re celebrating five years of The Nerds of Color alongside our friends at Racialicious and Kollaboration! Let us know you’re coming on Facebook! 2018 will be my fourth time at San Diego Comic-Con, but it will be the first time I ever step foot in Hall H! The holy grail of any Comic-Con, this year I get to cover Warner Brothers’ slate of DC Films, including Aquaman, Wonder Woman 1984, and Shazam! Here’s the awesome new Aquaman one-sheet to mark the occasion! 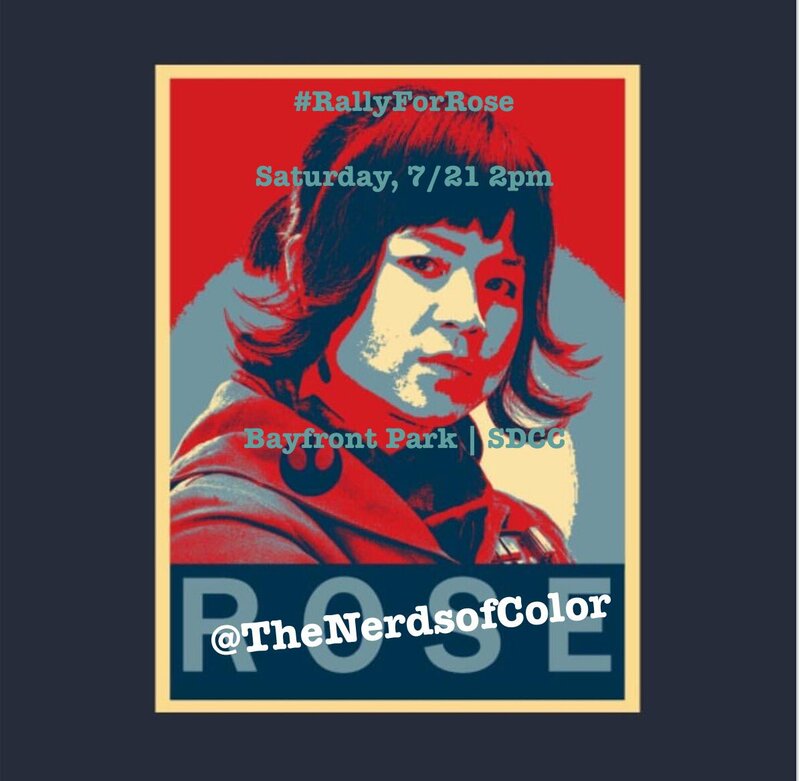 Later in the day, we will be organizing dozens of Rose Tico fans on the lawn between Hall H and the Hilton for the first ever “Rally For Rose!” I’ll be handing out #RoseForHope t-shirts with me Friday and Saturday as we gather to #ForceOutHate in Star Wars fandom. 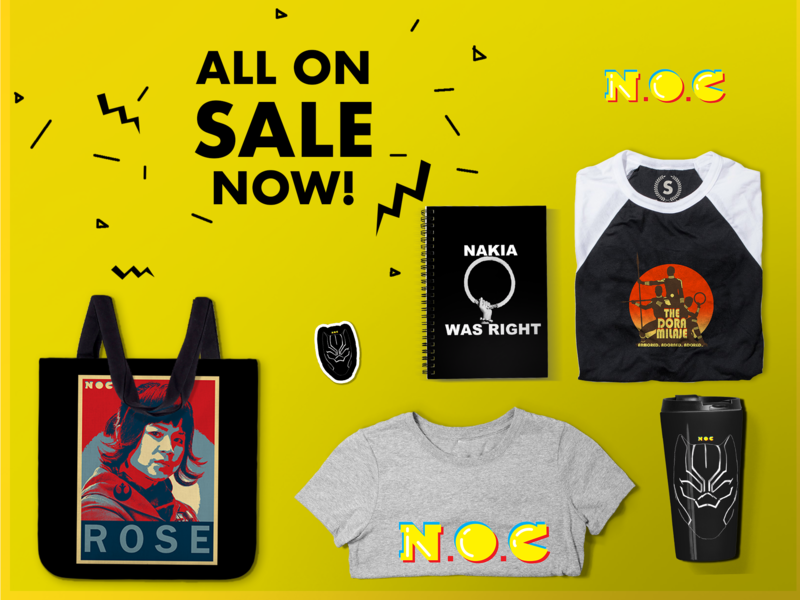 And shout out to those of you who have purchased the shirts from TeePublic so we can raise money for the National Asian Pacific American Women’s Forum. As I stated up top, I’m actually on two panels this year, and both are on Sunday. First up, I’ll be at the San Diego Public Library as part of their partnership with Comic-Con to host education-focused panels. At 10:00am, I’ll be joining GeekEd’s “Civility vs. Anger” panel alongside Jen Stuller of GeekGirlCon, Dr. La’Tonya Rease-Miles and Brian MacDonald of UCLA, Tony B. Kim of The Hero Within, and David Surratt of UC Berkeley. Last but not least, I have the honor to rejoin Racebending’s annual “Super Asian America” panel at 2:45! This year, Titans and Big Hero 6 star Ryan Potter headlines the all-star panel with NPR’s Mallory Yu, Arrow writer Tonya Kong, and Supernatural actress Joy Regullano to talk about gains Asian Americans have made in the superhero genre, and where we still need to go. This is my favorite panel of any Comic-Con, and I’m humbled to be part of it again. When I’m not at these events, I’ll be roaming the Convention Center so come find me!